Beautiful Recycled Bottle Lamps Up for Auction on Ebay! Beautiful Recycled Soda Bottle Lamps Up for Auction on eBay! Transform your living space with this dazzling Recycled Soda-Bottle Lamp designed by Sarah Turner. A stunning piece created with intricate cuts and careful assemblage, Sarah took some unwanted plastic bottle waste and turned it into gorgeous and eco-friendly decorative lighting suitable for any interior space. The Grand Prize winner of our amazing Spring Greening 2010 Contest, we’re offering Sarah’s captivating design to you Inhabitat readers, now exclusively up for auction on eBay alongside a number of our other awesome Spring Greening finalist designs! Whether you’d like a table lamp or pendant, with bidding starting at $280, you could be the proud owner of a custom, individual piece of art, that’s not only one-of-a-kind, but environmentally friendly as well! i´m looking for an eco-design workshop or course. can somebody help me? want to help and make a better and healthier world. Transform your living space with this dazzling Recycled Soda-Bottle Lamp designed by Sarah Turner. 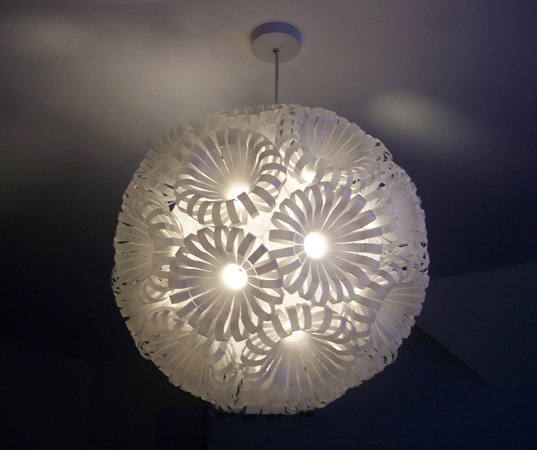 A stunning piece created with intricate cuts and careful assemblage, Sarah took some unwanted plastic bottle waste and turned it into gorgeous and eco-friendly decorative lighting suitable for any interior space. The Grand Prize winner of our amazing Spring Greening 2010 Contest, we’re offering Sarah’s captivating design to you Inhabitat readers, now exclusively up for auction on eBay alongside a number of our other awesome Spring Greening finalist designs! Whether you'd like a table lamp or pendant, with bidding starting at $280, you could be the proud owner of a custom, individual piece of art, that's not only one-of-a-kind, but environmentally friendly as well!